CLICK HERE TO START THE DOWNLOAD AGAIN. Click the "DOWNLOAD" button and you will see a pop-up window, asking whether you wish to open the file or save it to your computer Click "Save". 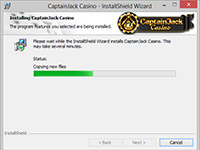 You will be asked to select a location on your computer to save the "CaptainJackInstaller.exe" file. Select a location and click "Save". 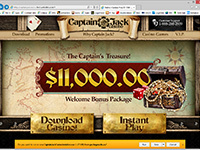 If this is your first visit to Captain Jack Casino you will be asked to setup a new account. Please use accurate information as it will need to be verified for any financial transactions including deposits as well as withdrawal requests. 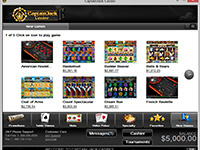 If you do not wish to download our Casino software, why not try our Instant Play No- Download Version? To Play our Instant Play No-Download version your computer must have Macromedia's Flash Player version 6 or above installed. Click Here to get Macromedia's Flash Player now.